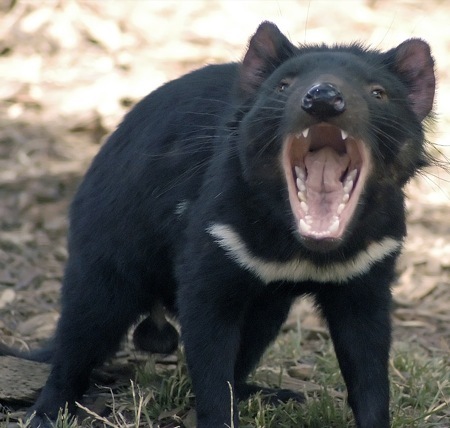 There’s been some buzz about the recent paper on the contagious tumor of Tasmanian devils.1 Clearly the thing is a ghastly disease that’s threatening the Devils with extinction — but from a technical viewpoint, the paper last year on a different transmissible tumor was much more interesting. Murgia, C., Pritchard, J. K., Kim, S. Y., Fassati, A., and Weiss, R. A. (2006). Clonal origin and evolution of a transmissible cancer. Cell 126, 477-487 . It turns out that the Tasmanian Devil tumor apparently can spread because it is essentially a self graft. Apparently Devils are highly inbred, and show very little polymorphism at the major histocompatibility complex (MHC) region. As I’ve been pointing out (ad nauseum) lately (see here and the links therein) this is really unusual, as in most vertebrates the MHC region is normally by far the most diverse region of the genome. The MHC region is important in graft rejection — duh, that’s what “histocompatibility” means. Essentially, then, it seems that the Devil tumor can “take” on virtually any other Devil, because it’s recognized as “self” MHC. 3 This is interesting, of course, but there’s nothing surprising about it. Endangered species are commonly inbred — inbred animals lack variation at the MHC4 — and matching MHC allows grafts to take. This is all known. The canine tumor story is very different. This tumor does not match the recipient dogs’ MHC. 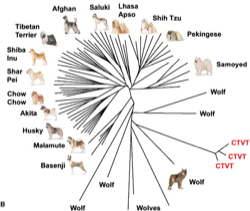 The same tumor can infect unrelated dogs, with virtually any MHC; Murgia et al looked at tumor-bearing dogs from around the world ( “None of the host dogs showed close relatedness to any of the others, consistent with the fact that they came from three locations in Europe, Asia, and Africa and were mongrels” ), and they all carried the same tumor. So why is CTVT not rejected as an allograft? Most, if not all, tumors in humans show evidence of having been edited by the immune system. That is, the tumors have altered their MHC expression in some way that probably allows them to evade the immune system. That’s one reason that tumors themselves are not rejected. (Presumably, there are many more proto-tumors that arise during our lifetime, that fail to alter their MHC and are destroyed by our immune systems before there are more than a half-dozen abnormal cells. We only see the successful ones.) CTVT has done this, as well, and expresses very low (but detectable) levels of MHC. Also, again like many other tumors, CTVT expresses an immune modulator, TGFÎ². 5 Murgia et al suggest that these are enough to make the tumor invisible to the immune system and allow it to engraft. The precise date when CTVT first occurred is difficult to determine. From its indistinguishable histopathology and its ability to grow as an allograft, it is likely that Novinski (1876) studied the same clone, and CTVT could have become established centuries before this date. Our analysis of divergence of microsatellites indicates that the tumor arose between 200 and 2500 years ago. Whether this time period represents the time the tumor first arose or whether it represents a later bottleneck in the tumor’s dispersion as a parasite cannot be resolved. While this estimated date indicates a relatively recent evolutionary origin, CTVT represents the oldest known mammalian somatic cell in continuous propagation, having undergone countless mitoses and host-to-host transfers. In fact, the tumor may even predate dogs. 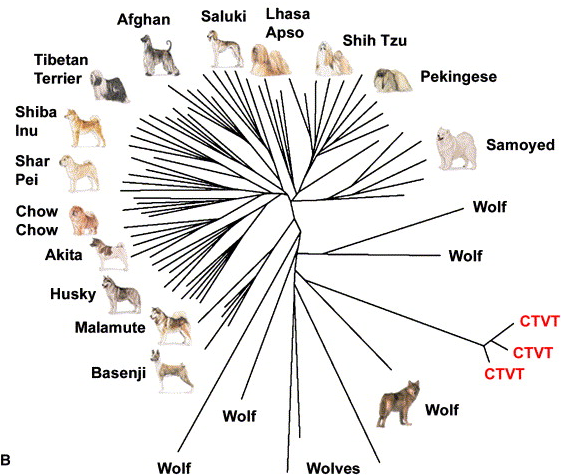 The figure to the right from Murgia et al shows the relationship between the tumor and dogs and wolves (click for a larger version)– the thing is even closer to wolves than it is to dogs. Frankly, the thing is damn creepy, and I kind of hope I’m right and there’s much more to its ability to persist than the really very common changes that have been pointed at so far, because I wouldn’t want to think that every tumor was capable of this kind of behaviour. Whatever it is, though, is more novel and scientifically interesting than the Tasmanian Devil tumor. Hopefully the Devil tumor is easier to deal with than the canine one. This entry is filed under Cancer, Immune evasion, MHC, Science. You can follow any responses to this entry through the RSS 2.0 feed. Both comments and pings are currently closed. Take a look at ref’s 21 and 22 from the original article. They’re referenced lower down in the discussion. I’m still looking at them now, so I can’t say yet whether they will explain the problem, but the abstracts look hopeful. Neither ref. 21 nor 22 is directly relevant. Both are reviews about human tumors, and neither mention CTVT at all. There are comments about NK inhibition by non-classical MHC, but that’s a generic statement that has been known for a long time — not support for the specific comment in question. blockquote>MHC class I molecules comprise the classical (class Ia) human leukocyte antigens (HLA)-A, -B, and -C antigens in humans and H-2K, D, and L in mice, and the nonclassical (class Ib) E, F, and G, in humans and Qa and Tla antigens in mice (Bjorkman et al., ). They form a trimolecular complex consisting of a 45-kDa heavy chain (HC), peptide antigen, and the nonpolymorphic 12-kDa 2-microglobulin (2-m) light chain. The HLA-A, -B, and -C and the H-2K, D, and L HCs are highly polymorphic (Bjorkman and Parham, ). In humans, the class I HCs are encoded by genes located within the MHC region on chromosome 6, whereas 2-m is encoded by a gene mapped on chromosome 15. In mice, these antigens are encoded in chromosome 17 and chromosome 2, respectively. The classical HLA/H-2 class I molecules are expressed on the surface of most mammalian cells with only a few exceptions (Le Bouteiller, ). It is estimated that there are up to 250,000 of each HLA class I molecule on the surface of a somatic cell (Parham and Ohta, ). Allorecognition of nonself from self predates the evolution of the highly polymorphic MHC system and is seen in yeast mating types, sponges, and cellular slime molds. However, natural chimeras (Buss, 1982) do occur in metazoans including colonial urochordates (Rinkevich, 2004), and CTVT can be regarded a special case of somatic cell chimerism. The driving selection for the evolution of the MHC system and cell-mediated adaptive immunity in early jawed vertebrates may have been as much to protect against malignancy as to protect against infectious disease because invasive and metastatic tumors develop only in vertebrates, whereas infections are universal. It’s pretty clear that Murgia et al are thinking in large clade terms. They are probably assuming that the reduced class I expression was all non-classical, but don’t say so because the research necessary to confirm it was not performed. Siddle et al seem to be jumping to conclusions here (poor peer review), but it’s a pretty obvious conclusion in view of ref 22. So they are not arguing that non-classical MHC is DOWN-regulated but rather that it’s UPregulated, and they are very clearly refering to the CTVT, not a generic effect. What’s more, when they make that claim they only cite a single reference, and that reference does not supprot their claim. Nor is there any claim anywhere in the literature that CTVT upregulates non-classical MHC. I’m not claiming that non-clasical MHC doesn’t block NK, nor that it’s not a tumor immune evasion pathway — those are both trivial observations in that they’re widely known. I’m specifically saying that they’ve made an unsupported claim. And specifically it’s not an obvious conclusion for CTVT; there are lots of tumors that do NOT upregulate non-classical MHC, yet manage to be resistant to NK as well as classical CTL. Many tumors, including CTVT, avoid immunological recognition by down-regulating classical class I (class Ia) expression and up-regulating nonclassical class I (class Ib) expression (10, 21, 22). By expressing class Ib molecules, tumor cells avoid recognition by natural killer cells and escape immune recognition by T cells (22). Your quote comes from the introduction, the one above comes from the discussion section. Presumably, they thought a summary in the introduction was OK when the detail was in the discussion. The question is why they include CTVT in that class. A recent study (Hsiao et al., 2004) shows that, during progressive growth, secretion of TGF-Î²1 by CTVT acts as a potent local inhibitor of host immune responses, as does the downmodulation of DLA class I and II expression observed by us and others (Cohen et al., 1984). Thus, the evasion of host immune responses has enabled the tumor to survive and grow until it can be further transmitted. The foregoing analysis shows that CTVT has been transmitted as an allograft across many DLA types through innumerable hosts. Although dogs that have recovered from CTVT are immune to tumor development upon reinoculation, naive dogs of many breeds are susceptible to tumor growth (Cohen, 1985). A recent study indicated that secretion of tumor growth factor Î² (TGF-Î²1) may play a role in local immune suppression during progressive growth but that interleukin 6 secretion by tumor-infiltrating lymphocytes aids eventual immune destruction during tumor regression (Hsiao et al., 2004). However, the expression of MHC antigens in CTVT has not been analyzed in detail. One study based on immunostaining indicated that Î²2-microglobulin could not be detected on CTVT cells (Cohen et al., 1984), but MHC mRNA expression has previously not been examined. We therefore performed RT-PCR with tumor-specific and host-specific primers within the tumor tissue of Sicilian dog C in order to investigate differential expression of tumor and host DLA genes. Figure 6A shows that class I expression was lower in tumor cells than in stromal cells (which serve as a loading control) and that class II expression was absent. This result indicates significant downmodulation of DLA expression in the tumor cells because they were the majority population (not, vert, similar90%) in the microdissected tumor tissue (Figure 6B). If class I genes were wholly unexpressed, NK cells might eliminate the tumor; hence, our finding of low expression appears more plausible than the suggestion of defective Î²2-microglobulin (Cohen et al., 1984). A systematic and quantitative analysis of several tumors during different phases of growth and regression would be required to elucidate this phenomenon more thoroughly, but that is beyond the scope of this study. Nonetheless, our finding of DLA downregulation at the transcriptional level is consistent with previous suggestions (Cohen, 1985 and Hsiao et al., 2004) that, during progressive growth, CTVT has adapted to evade host immune responses. Now as I understand the last paragraph, there is a reduction of the amount of Class I expression. Nothing is said whether the remaining Class I is classical or non-classical. Siddle et al are clearly taking it to be non-classical, that is a complete elimination of classical and upregulation of non-classical. But Murgia et al‘s results appear to be equally consistent with a reduced amount of classical and no non-classical. Agreed? So the question is, what is there about ref’s 21 and 22 (see above) that justifies assuming the presence of non-classical. I can’t even get into ref 21 without buying it for $30, which I don’t intend to do, but ref 22, which is pointed to humans, is describing a set of 7 “major altered HLA class I phenotypes have been defined in different tumor tissues” of which the last is “Phenotype VII: Downregulation of classical HLA A-B-C molecules and appearance of HLA-E molecules” which corresponds to what Siddle et al seem to be assuming. The others phenotypes seem to me (so far) to be human specific, so perhaps Siddle et al are assuming number 7 must be the explanation (which would be a distinct error). OTOH perhaps the other results in ref 10 imply, or may imply, that option 7 is the correct one. I’m still trying to figure it out, myself. I’m sorry, but you are really confused. Let me repeat my point here. Siddle et al claimed that CTVT evade the immune system because it downregulates classical MHC and upregulates non-classical MHC. There is nothing in the literature that supports that. Period, end of story. You are apparently trying to support the claim that non-classical MHC can be upregulated on tumors. Yes, it can; that’s widely known, it doesn’t need support. But since not all tumors do that (again, a widely known point), it means nothing at all for CTVT; it’s not relevant. You can’t look at reviews on broad trends in human tumors and expect them to explain everything about one specific and very unique tumor of dogs. You’re also making points about classical MHC downregulation on tumors. Again, this is widely known, and has been convincingly shown to be down-regulated on CTVT. It’s not my point. I repeat: There is nothing in the literature that looks at non-classical MHC on CTVT. Siddle et al are making the claim that there is something about non-classical MHC on CTVT, and they are wrong. It’s that simple. It’s not a big deal. They made a throwaway comment in their intro, probably mis-remembering something or conflating two different tumors, and the comment got missed in peer review. The reason I pointed it out, though, is that it’s very relevant for the point of my blog post here. The point I wanted to make is that for CTVT — unlike Tasmanian Devil tumors — the reason the tumor can spread between individuals is not known. Siddle et al — again, this was a throwaway statement in their intro — claimed that the reason is known, and they’re wrong, it’s not; the mechanism they pointed to, has not been demonstrated.